Posted by Jon in Marvel, Mezco, Review with 0 comments. Mezco upped the ante with two One:12 exclusives for San Diego Comic Convention this year. Both Marvel, by the way. And thus, I was all in! As can be expected, both exclusives this year are alternate outfits for figures that we’ll see later on: X-Men Deadpool and Miles Morales aka Ultimates Spider-Man. In a way, these are nice previews for the “proper” figure releases. I’ll get to Deadpool some other time; right now I want to focus on my main man, Miles. Ever since the original announcement of Spider-Man coming to the One:12 collective, I’ve been super curious as to how a smaller-scaled, tailored cloth figure would turn out. The regular comic outfit was delayed, so we ended up with Miles as our first look at the Mezco Spider-Man body. Overall, I’m pretty pleased with it. While it doesn’t have the deep posing ability of a Marvel Legends’ body, it makes up for it in other respects. First off, the accessories are really nice. All of the One:12 figures come with a great selection of accessories, but the character specific ones that come with this Spider-Man are particularly impressive. 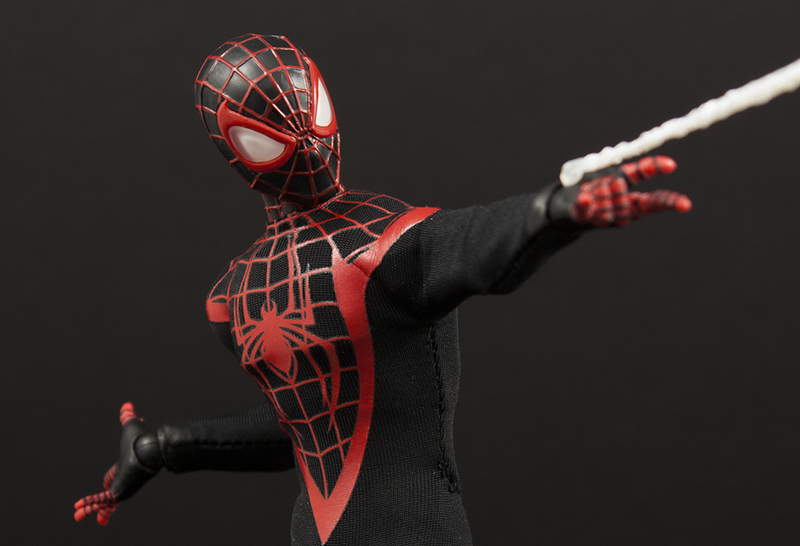 Miles includes two extra sets of hands, four plastic clip-on web effects, a long wire-frame web, a figure/flight stand, and a magnetic figure clip. With a total of six included hands, he comes with a pair of open, thwip, and closed hands. The web attachments wrap around the wrist peg and secure once the hand is completely attached. The magnetic stand was a bit of a surprise! I don’t recall if it was part of the original solicitation (edit: just checked the store page at Mezco and it is not mentioned), but it was bubble wrapped and loose in the box. So I’m assuming it was a last-minute addition. I don’t have many metal surfaces to stick him on, so check out this picture of him on my refrigerator! Going into this I was a little concerned about the transition from the cloth body-suit to the plastic head. I’m happy to report that it looks pretty natural in hand. The cloth outfit is overall pretty good. It feels tough, and I haven’t hit any poses where I felt like it was going to rip or tear. The elbows can also look a bit odd and more “toy like” at some angles. They may want to consider refining the sculpt to make the elbows a little more pointy on future figures. I think that this will give them a more natural look under the suit. I’m really impressed with the range of motion in his neck. It’s very rare you get this in an action figure, but Miles can look straight up! The acrylic lenses on his eyes looks great, and really make you feel like you’ve purchased a premium action figure. All of the web-lines on his head are painted cleanly and they seamlessly blend into the webbing on his cloth outfit. I wish there was more ankle range. He’s (Ultimate) Spider-Man, dammit! He needs to be able to bend himself into pretzels, and those ankles should be there to support him. Unfortunately, the range of motion in his ankles is fairly limited, which is probably my biggest disappointment with the figure. Getting him into really deep crouches isn’t going to happen. Thankfully he has other great features like the webs and flight stand to distract me from this. The other con at work here is scale. I’m assuming that this is the same body they plan to use for Peter Parker Spider-Man. So it’s a little big for Miles. As you probably can see from the pictures above, he towers over the Marvel Legends version. It’s still a super fun figure to mess around with, but if scale is important to you, you’ll probably want to look elsewhere. Would I recommend Mezco’s One:12 Miles Morales Spider-Man? I would — with a caveat, he’s currently on wait-list over at Mezco. If you can get this figure at around asking price of $80 he’s worth it. If the aftermarket goes any higher then I would recommend just passing on this one and putting in a preorder for the regular or black-suit Spider-Man. Miles is far from perfect, but he’s a fun distraction from the masses of Marvel Legends Spider-Men I own. The soft goods work surprisingly well. If the body was a little better articulated and more to proper scale this could easily be a home run.